It is believed that all wishes are fulfilled on Christmas…even those of cats. When The Smiths' naughty kitten gets carried away while playing, it accidentally damages a gorgeous Christmas chain of lights and right on Christmas eve! It's easy to guess what the Smiths are dreaming about - new Christmas lights! Let's fulfill their wish and help them mend the Christmas tree lights, turn the lights on and celebrate Christmas joyfully! 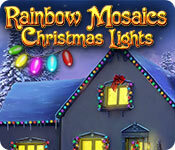 Rainbow Mosaics: Christmas Lights is rated 4.3 out of 5 by 20. Rated 5 out of 5 by smfs from Wonderful Atmosphere; True to Christmas This quickly became my favorite mosaic griddler game. I love mostly that it feels interactive like I'm getting more value for my dollar. I found it much more enjoyable than Fantasy Mosaics which always seem to be mocking the players with the ridiculous colors, penguins, and silly, nonsensical gardens. Honestly, we're not idiots. The hues and colors in this game are true to Christmas (green, gold, red, blue and purple) even if the theme itself is not Christmasy. Nothing is off or jarring. I was having trouble seeing the default tiles--an issue with a lot of griddlers--so it was great to discover the ability to change tiles. I love the treat of playing mahjong every 9th game. (These are done with brightly colored Christmas tree balls, challenging without being overly so for those who aren't into mahjong.) It's fun decorating the tree, getting bonuses, and watching the kitten move about the room or track the cursor with its eyes. The family makes me smile every time they stretch to the top of the tree. It will be a great game to haul out every December and still feel fresh. Lovely! 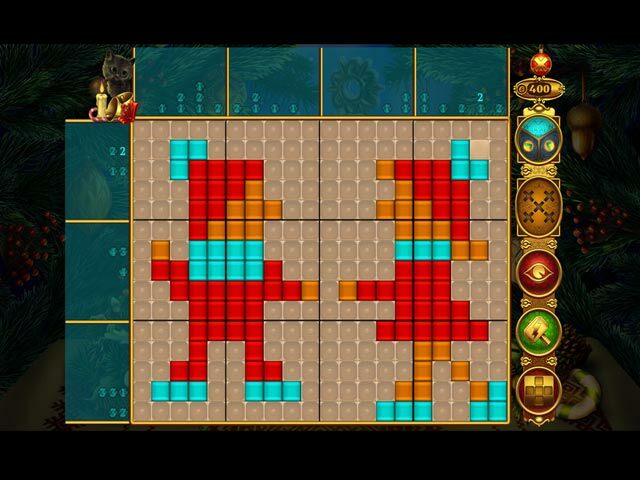 I will definitely check out the other Rainbow Mosaic games. Rated 5 out of 5 by HeadDoc from Best Ever I have tried several different Nonograms/Mosaics, but keep coming back to this one. After finishing the regular game, play on Expert level for a more challenging game. Rated 5 out of 5 by diseased from The best mosaic game on Big Fish I stumbled this - after trying it, I was surprised at how much I enjoyed it. 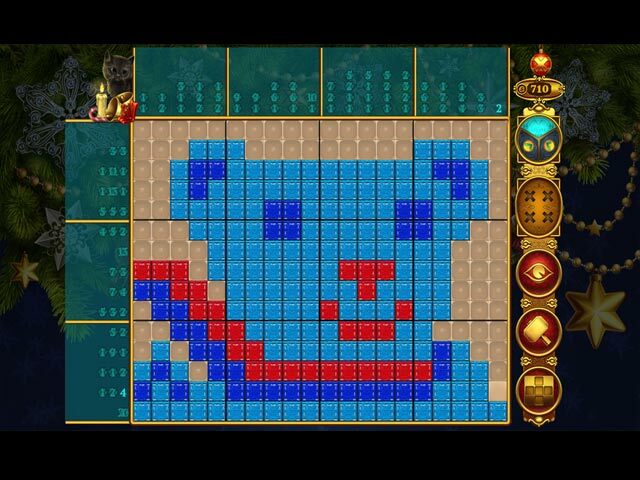 I then tried a few other mosaic games, and they did not work as well as this. Can you please do some more? Rated 5 out of 5 by roselady9000 from Still Playing It and Loving It It's after Christmas and I am still enjoying playing it. When I need a cheerful lift this is one of my go to games. I love mosaic games. You get to shift from color to color which helps in puzzling it out. I have enjoyed other games by Awigor. Rated 5 out of 5 by Rythy from love it! 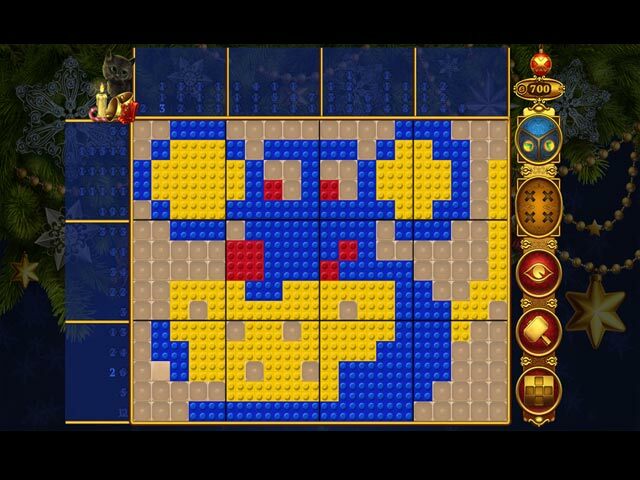 As others have said, better than fantasy mosaics! Rated 5 out of 5 by Linca1 from A must buy for mosaic-fans All the best from previous mosaic games all fitted nicely into this version. So be it's a christmas version, and the levels are the ornaments on the christmas-tree,but the pictures are all-year round (mainly). I like the pictures, I like the different hints you can use (and upgrade if you like) pluss obviously the hunt to gain 3 stars on all levels. Rated 5 out of 5 by may16j2 from Interesting Music The game is all that others have said and I concur. but after playing it for awhile, I became intrigued by the music and finally checked out the credits. Two composers. The better known of them is a jazz guitarist and the music by the tree is based in jazz, but it is Christmasy by the addition of instruments that chime. A piece by the other composer shows up occasionally during a grid. It captures the deep silence of outer space broken by the haunting howl of a lonesome wolf. Sometimes I turn the music off when I find it irritating, but I left it one for this whole game. Yes, it repeats but it was okay with this music.